Yesterday, we had a potluck picnic in the park with other families in the neighborhood. One of the (many) things I brought along was this potato salad, which was a hit the last time I was at a picnic (with my family), so I decided to make it again. While I can make potato salad with mayonnaise that comes out great, I didn't feel like making homemade mayonnaise, so decided to make a mustard based one, which, while different than the standard, is just as delicious, and in my opinion, a lot more delicious. I tend to make this a day in advance, and let it soak the flavors in, but it can also be made and eaten immediately. It's automatically gluten free, egg free, vegan, sugar free, etc... I'm sure if you wanted to, you could use fresh garlic and onions in this instead, but I didn't do it that way, so I can't tell you exactly how to do so. 1. Boil the potatoes until soft. Cool down. 2. Peel the potatoes if desired. If they have rougher skin, I recommend peeling. If they have paper thin skin like mine have, or smooth skin like red potatoes have, feel free to leave it on. 3. Chop up the potatoes- If they're large potatoes, I usually cut them into 6 or maximum 9 pieces, smaller potatoes 4-5 pieces. 4. Boil your peas and carrots. I took a 1 lb bag of frozen peas and carrots, boiled them in a bit of water for maybe 10-15 minutes, including the time it took to melt, and strained them. You can cook them longer if you want, but I wanted mine a little more crispy. 5. 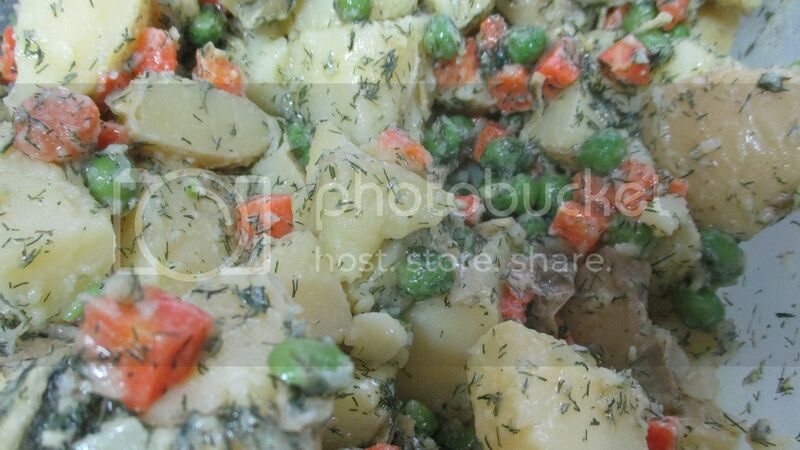 Add your strained peas and carrots to your potatoes. 6. Mix the rest of the ingredients together. Whisk well. Use less vinegar, garlic, and salt to start out with, and add more if you feel it is necessary. If you eat it straight away, you'll want less of those, but if you let the salad sit for a while (like overnight) before eating, you'll probably want more. 7. Add to the potatoes. Mix well, so that everything is evenly covered. Adjust to taste as necessary. Are you a fan of potato salad? What is your favorite way to make potato salad? Does this look like a recipe you'd enjoy? I love potato salad, but have never thought to add peas and carrots. I will try this version of potato salad sometime this summer. I also like to add chopped up hard-boiled eggs to my potato salad. so good! i left out the peas (not a fan) and used fresh carrots. i have dressing left over and will cook more potatoes and carrots for Shabbos.